Is this room spectacular or what? It's modern, classic and sophisticated! 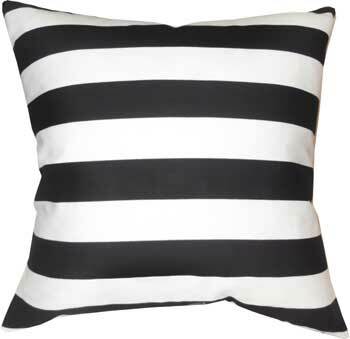 There is a large amount of stripes in this room, yet it's not overbearing. And the symmetry and clean lines displayed throughout give the room great balance. I could just plop this room right into my house! This is another example (as shown in a previous entry). If you don't have the money to invest in a rug, buy a few pillows and get the same look in your room for a fraction of the price. Whoever said black and brown don't go together was seriously mistaken. Look at this gem. 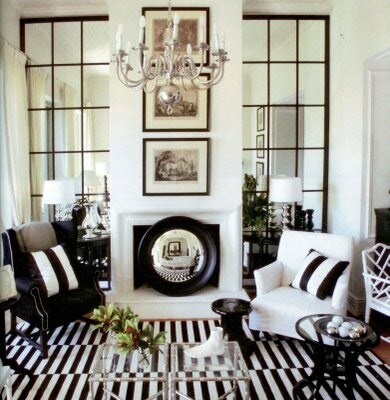 The bold striped rug is a great anchor for the nearly all white room. 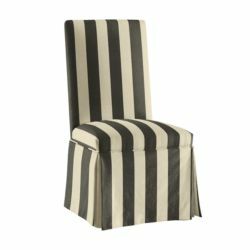 And the mix of the distressed coffee table and chair with the tailored lamp shades and contemporary white Louis Ghost armchair give the room elegance without making you feel like it isn't livable. Talk about shabby chic. And the last piece is one you can have made at Ballard Designs. It is sure to dress up any space!